We are the Temple of I AM! Nothing clicked at the time although the words Light, Way and Truth are meaningful to me. A few days ago, the post below suddenly dropped on my lap, so to speak, from I-don’t-know-where-it-came-from. This was very mystical, to say the least, and a few more dots got connected, meaningfully so. We must keep in mind that all sacred texts available to Earth humans were written by people residing on the 3rd dimensional plane of duality. In addition, what we know as the Bible today has been translated numerous times from Aramaic, Hebrew, Greek, and Latin into our national languages, such as English, French, etc. As all translators know, words in one language often do not have an equivalent word in another language. For that reason, much of the original meaning can be lost in translation. In addition, the meanings of words change as time passes. The belief system of the translators also influences the choice of words they use in their translation. As a result, the Bible contains numerous contradictions. Still many Christians are taught that the Bible is the infallible Word of God and is literally true. Christians are often taught to “stay in the Word,” meaning not to explore outside sources for answers to their questions about God and life. “Don’t ask questions or you will lose your faith” is a frequent admonition given by religious leaders. The reproof itself is an acknowledgement of uncertainty within a very shaky faith. We do not know what we do not know and for many, this is a frightening fact. This strong tendency to stay in the box created by religious leaders, creeds, and denominations has resulted in Christians closing their minds to anything new relating to their own spiritual nature. Christians have feared to explore, to intuit Truth for themselves, and to go against the status que. In order to remain one of the many, we stifle our true feelings, our questions about life, our innate urge to explore and find Truth for ourselves. We even read Jesus’ encouragement to “seek and ye shall find” and “the truth will set you free” as if he meant seek only in the Bible and the truth you find there will set you free. Christians forget that the New Testament did not exist during Jesus’ lifetime. Any suggestions in the New Testament that we “stay in the Word” or “not change the Word” relate to the Old Testament because that was the only scripture known to the New Testament writers. Near the end of the 19th century and into the 20th, teachers of advanced spiritual maturity began to incarnate to guide Earth humans in exploring metaphysical or hidden wisdom teachings regarding the Truth about God, our world, and ourselves. Sadly, the churches rejected these teachings as pagan, heretical, and New Age. What the church really meant is that the hidden wisdom did not conform with orthodox creeds/beliefs. It feared its adherents would ask questions and lose interest in orthodoxy. Teachers like Ernest Holmes (Science of Mind), Helen Blavatsky (Theosophy), and Charles Fillmore (Unity) were and are called leaders of cults—words used in a derogatory manner representing the condemnation of many religious authorities even though the teachings of these men and women have added greatly to Earth humans’ understanding of themselves and the laws by which the universe operates. Yet the churches have not possessed or encouraged the development of “eyes to see and ears to hear these hidden wisdom teachings. This brings us back to the importance of understanding the meaning of the I AM sayings. Jesus again speaks to us “the one who believes in me will also do the works that I do and, in fact, will do greater works than these.” John 14:12 Jesus expected us to follow his example, NOT worship him. Christianity teaches that “Jesus did it all.” As a result, we make no effort to do the works that Jesus did and, in fact, exceed his works. Christians are taught, instead, to love Jesus as Lord & Savior. Self-realization is considered “New Age.” Holistic growth—body, emotions, mind, and spirit—is not a part of Christian teachings. Self-help books are often off-limits. Yet, in John 15, Jesus states, “I am the true vine, and my Father is the vinegrower… I am the vine, you are the branches.” John 15:1,5 Anyone who has seen a grapevine knows that the main vein is composed of the same substances as the branches—Jesus and all of humanity possess the same potential. We are to learn to do all the works Jesus did and more. With the Father as vinegrower, Jesus as the vein, and humanity as the branches, we are All One. Jesus, the man, fully recognized that God dwelled within him, just as God dwells within each of us. Jesus allowed God to speak through him—what we call channeling in today’s world. One of the Ascended Masters’ teachings concerns the I AM PRESENCE within each of us. When Christian religious leaders heard of the 20th century I AM PRESENCE movement, they pronounced it “New Age” and not in accordance with Christian teachings. Because religious leaders have ignored the hidden wisdom teachings, they are unaware of the ever-expanding cycles of time. New Age simply means the beginning of a new 2000 years cycle, just as the 21st century indicates the beginning of a new 100 years cycle and the New Year signifies the beginning of a new one year cycle. Whether or not we set out to do so, we end up learning something new during each year and during each century; we are and will be learning much that is new in this New Age of Aquarius. 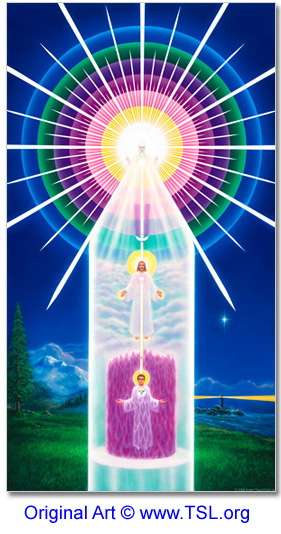 The top figure radiating light outward to the world is the I AM PRESENCE indwelling each of us. Jesus taught the Kingdom of God is within you. Christianity has taught God as separate from us; we have personified God into our image and set him on a throne in heaven. This personified God is a vengeful, angry God that demanded a blood sacrifice in order to appease his threats to punish us in an eternal hell of fire. 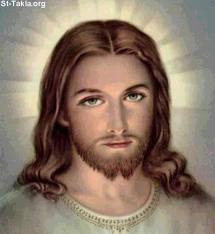 Sadly, in our personification, we have created an image of God that is far less than any of us can imagine being. Which of us would require the blood sacrifice of one of our children so we, as parents, could bring ourselves to forgive another of our children? In order for us to learn to do all the works that Jesus did, we must go to our inner Mount Horeb and become One with our I AM PRESENCE. We are not separate from God; God indwells each of us. I AM is the bread of life, the light of the world, the gate, and the resurrection and the life. We are the Temple of I AM! Through Jesus and through us, I AM is the Way, the Truth, and the Life. [ii] Throughout this article I will use the term GOD to refer to the SOURCE OF ALL THAT IS. [v] Metaphysical Bible Dictionary, page 284. This entry was posted in Authors, My Personal Path, Uncategorized and tagged God, I AM Presence, Master Jesus, Pathway. Bookmark the permalink. 3 Responses to We are the Temple of I AM! Interesting. You know that I lived on the Royal Teton Ranch for a time. I met ECP several times. Intimidating woman. And I’m still working with Masters… life is funny. Thanks. No, Eliza, I didn’t know. Royal Teton Ranch must be close to Grand Teton, WY. Why would she be intimidating? You mean, to you at the time? Thanks for stopping by! She was very Blue Ray and intense, not very cuddly and warm. Distant to newcomers and only allowed a few permanent staff to have much access. The RTR was north of Gardner, MT, or north of Yellowstone Park. I watched the big fires burning close to the time I left there. I was glad to leave, although it was an educational experience for me. I was there two years.